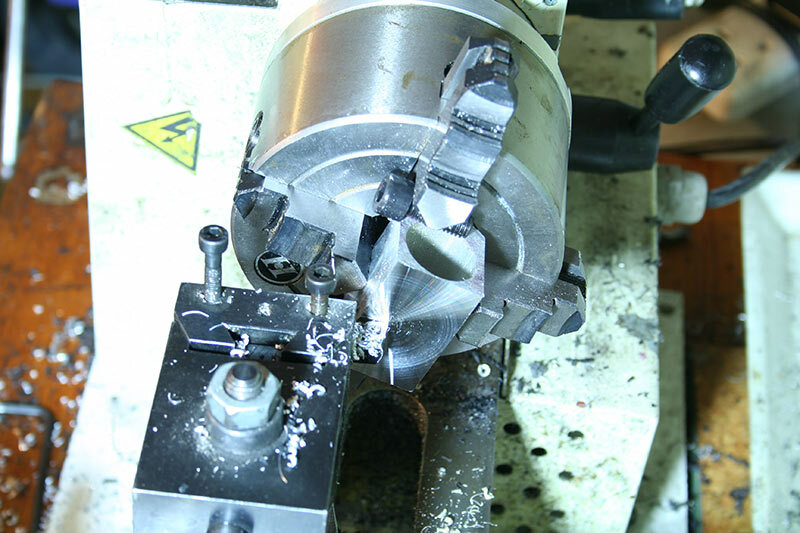 Squares: Turning a square part on a mini-lathe. 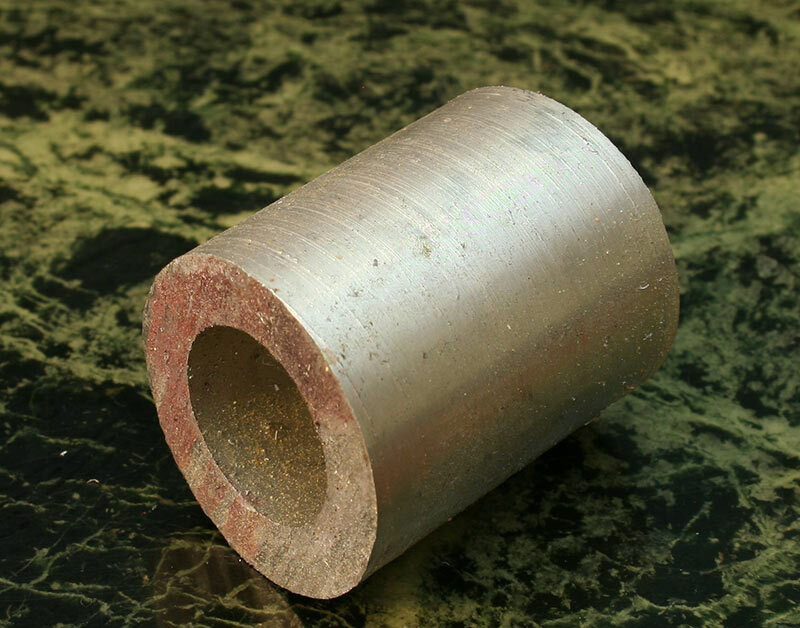 It is not initially aparent to the new mini-lathe owner that they can make square parts on their mini-lathe. 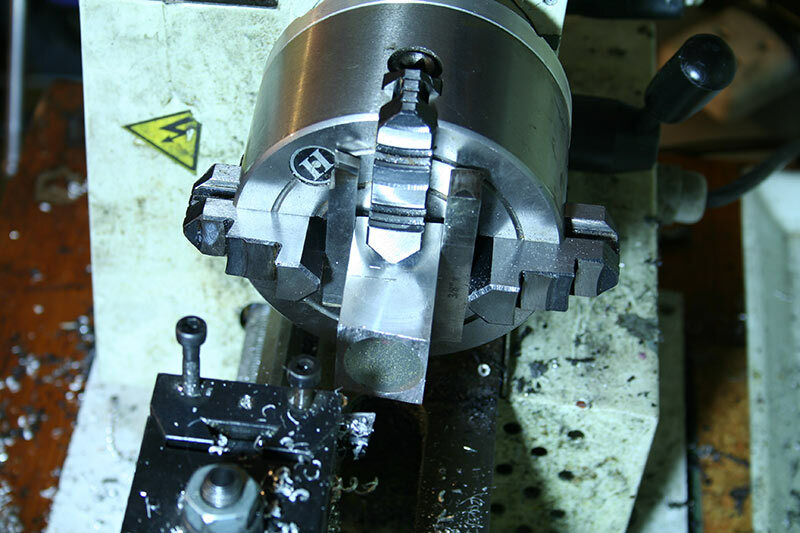 Using a 4 jaw independent chuck it is possible to mount stock on all sorts of strange and interesting ways. 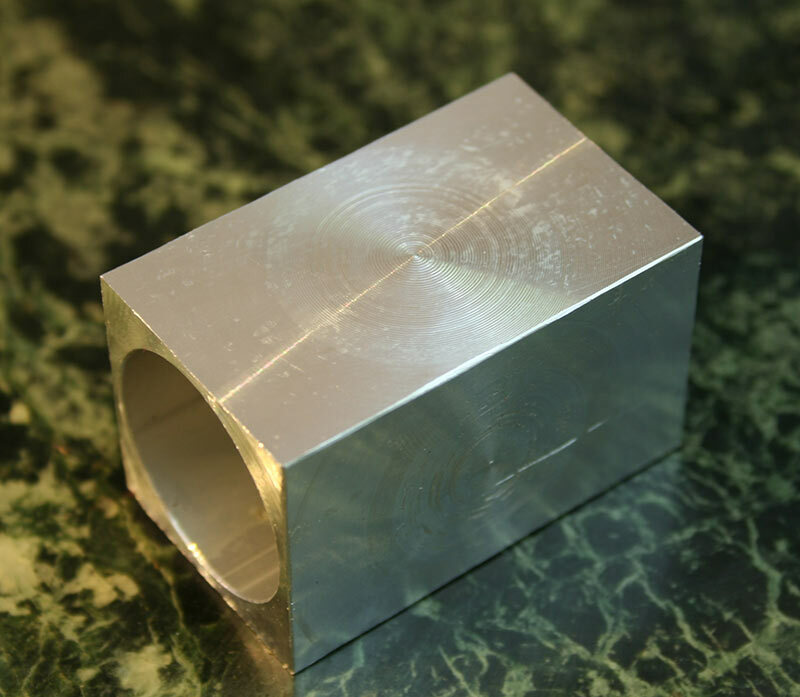 An artifact of this means that you can actually machine a pretty good square part using a lathe. Of course, a lathe turns things, and normally you expect to make round things on a mini-lathe. However, a mini-lathe is also very good at cutting flat smooth surfaces - i.e. by facing. As a sqaure part is simply a collection of flat faces, then it is not suprising that you can make square parts on a mini-lathe. 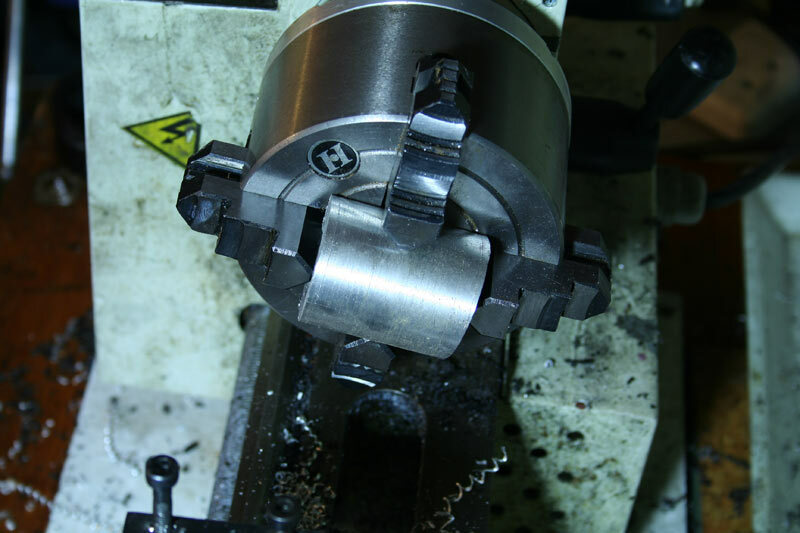 The standard chuck on a mini-lathe is a 3 jaw chuck. Such chucks are not good at gripping square things. They are only for gripping round things. However, the 4 independent jaws of a 4-jaw chuck mean that yo can grip pretty much whatever you want, with a little bit of creative thought! I have some unused stock which was part of an old driveshaft. I decided to have a play one afternoon and make a strange yet interestings (and utterly pointless) sqaure thing to demonstrate making a square thing on the mini-lathe. Here is the raw stock. As you can see it is predominately round. It features a round bore down the middle and an rought round exterior. Even the ends are roughly cut and not even remotely true. The first step is to mount the stoc k on the mini-lathe. I've used a 4 inch 4 jaw independent chuck. Mounted in this fashion it is extremely secure and I am able to make quite heavy cuts. Now we take some normal facing cuts on the outside edge. Because of the irregular shape being presented to the facing tool, the forces on the part will be heavier than normal facing of round stock. 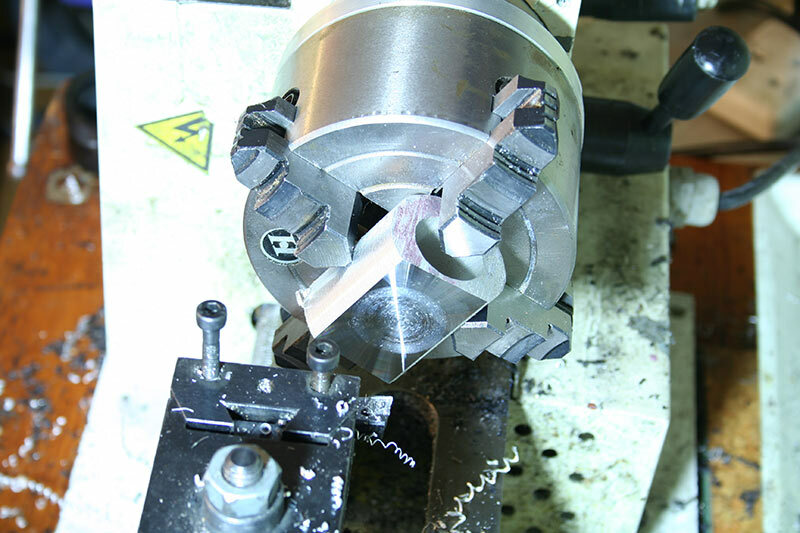 The 4 jaw chuck on the mini-lathe is more than capable of holding the part firmly. Now we turn the part around in the 4 jaw independent chuck. 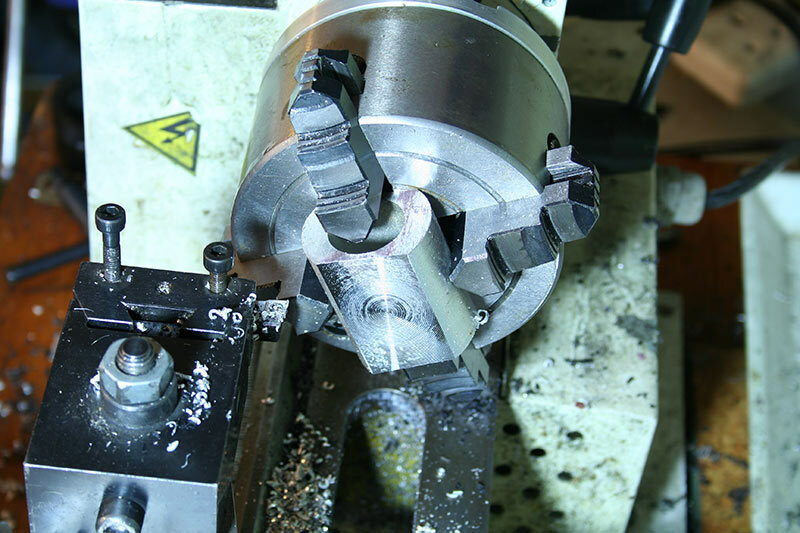 The newly faced surface is placed flat against the (hopefully) flat face of the chuck. We then face the newly presented front face. This gives, hopefully, two opposite faces which are parallel. Here we are towards the end of the second facing operation on the mini-lathe. The round stock is now starting to look more like a square thing - a bit like a fig roll. 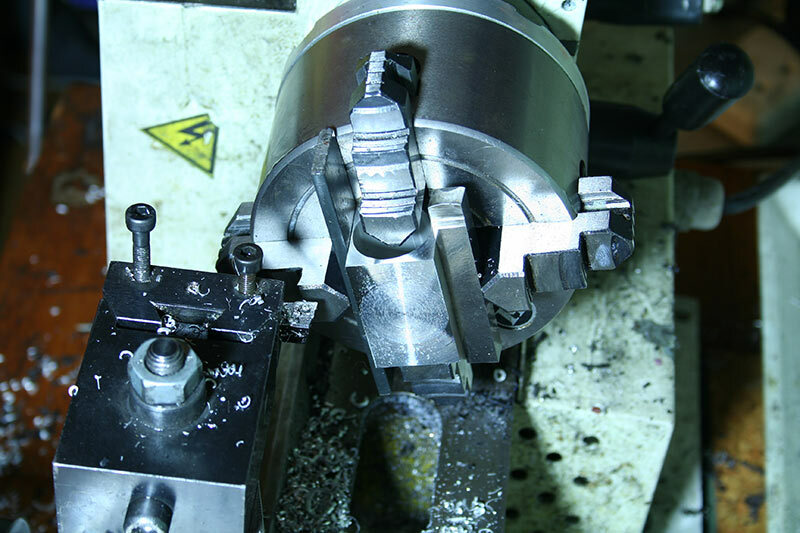 Now, using these two newly faced parallel sides we can re-mount the part in the 4 jaw chuck once more. After 4 facing operations we now four square sides on the long axis of the job and can now mount it the other way around so that the ends can be faced. 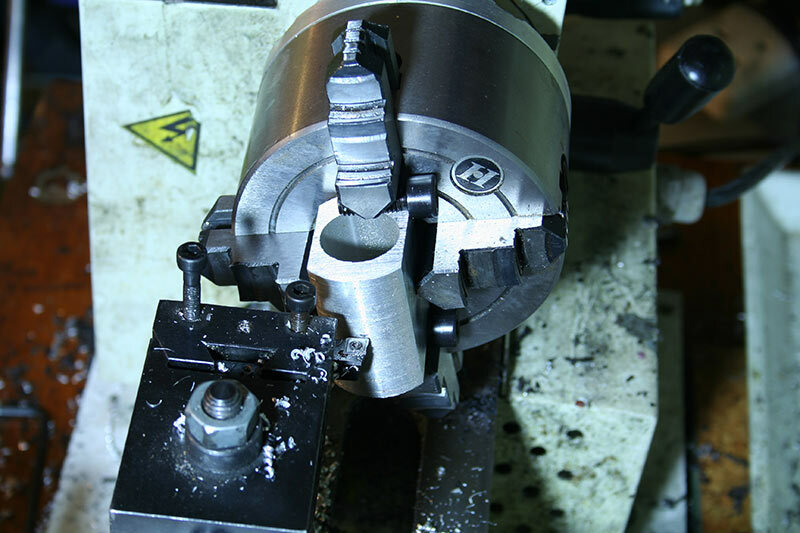 To clean up some jaw marks from the 4-jaw chuck, I mount the part carefully using spacers and take a fine finishing cut. With a bit of creative thought, even the most irregular parts can be held in the 4 jaw independent chuck. We can then take facing cuts on the end to get a nice flat surface - probably a surface of better quality than can be obtained using my micro mill, and certainly a lot more quickly.